On March 21st, 2017, six days after his 69th birthday, my dad was diagnosed with ALS. He had been having difficulties with his knee giving out for several months, starting in the fall of 2016. We had never anticipated the nightmare that this was not a simple physical problem, but a neurological degenerative disease: until my mom and dad had met with neurologist Verica Neskovic in Wausau WI, who immediately suspected ALS. After a slew of tests, including a false positive for Lymes Disease and final EMG testing, Dr. Neskovic diagnosed him with our greatest fear. At the time of that appointment my dad was still able to walk with the use of a walker and had decent general use of his limbs, hands, and voice: Dr. Neskovic gave him 3-5 years based on what she saw at the time of the appointment. Since then my dad has taken a sharp decline, and as of the writing of this reflection (August 31, 2017) he has lost all movement other than a couple inches with his left foot, the ability to turn his head slightly, and a rapidly diminishing voice. My dad now lives in an assisted living facility in my hometown in Wisconsin, and is on hospice care. I’m currently writing his funeral and am creating a drawing for the cover of his funeral program, so that he can hear the funeral and see the drawing before he passes away. Over the past year or so, my wife – courtesy of the help and instruction of a good friend and neighbor – has been raising and then releasing monarch butteflies. 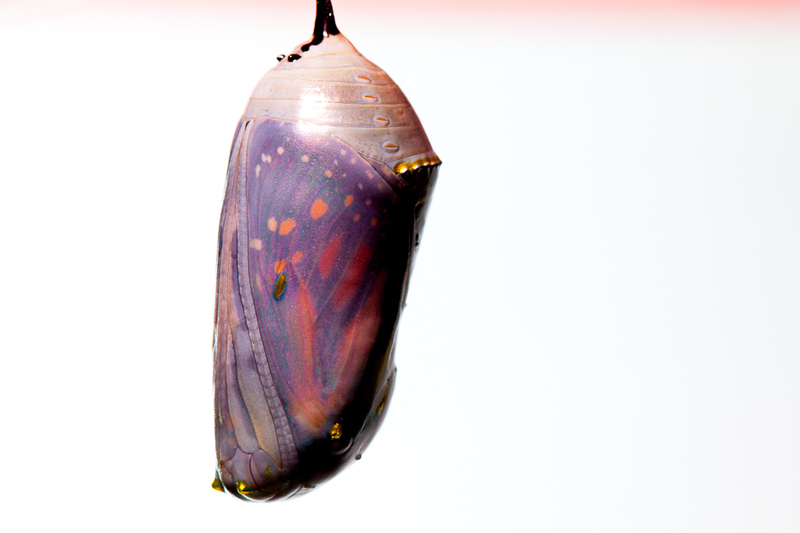 The monarchs are truly amazing to watch as they transition from caterpillar to butterfly – and seeing the chrysalides up close is really amazing as they look like beautiful works of art: especially when the butterflies get close to coming out and you can see their wings through their chrysalides. I took the above photo as a reminder that my dad still has tremendous beauty within him and around him despite his being trapped in his own body by ALS: a truth that I believe applies to all of our hospice patients, no matter what disease is affecting their bodies.